The 57th Annual Grammy Awards were held on February 8, 2015, at the Staples Center in Los Angeles, California. The show was broadcast live by CBS at 5:00 p.m. PST (UTC−8). Rapper LL Cool J hosted the show for the fourth consecutive time. Sam Smith won four awards, including Best New Artist, Record of the Year, Song of the Year for "Stay with Me" and Best Pop Vocal Album for In the Lonely Hour. Beck's album Morning Phase was named Album of the Year. This prompted Kanye West, who later said he thought Beyoncé should have won, to jokingly leap onstage to interrupt Beck in a re-enactment of his 2009 MTV VMA scandal, but West left the stage without saying anything. Both Pharrell Williams and Beyoncé took three honors; with her wins, Beyoncé became the second-most-honored female musician in Grammy history following Alison Krauss. Lifetime Achievement awards were given to the Bee Gees, George Harrison, Pierre Boulez, Buddy Guy, and Flaco Jiménez. ^ Michael O'Connell (February 9, 2015). "TV Ratings: Grammy Awards Lose 3 Million Viewers From Last Year". The Hollywood Reporter. Retrieved February 10, 2015. ^ "Grammys: LL Cool J To Host for Fourth Year in a Row". The Hollywood Reporter. January 21, 2015. Retrieved January 22, 2015. ^ Ann Oldenburg, USA TODAY (December 5, 2014). "2015 Grammy nominations roll out". USA TODAY. ^ "Kanye West causes stir at Grammys with Beck, Beyoncé comment - Arts & Entertainment - CBC News". cbc.ca. Retrieved March 8, 2015. ^ "Grammy Awards 2015 – as it happened". BBC Sport. February 9, 2015. Retrieved February 12, 2015. ^ Higgins, D (February 9, 2015). "New this week: The Walking Dead, Gogglebox, The Affair, Grammys, ICC World Cup, Super Rugby and more". The Green Room. Foxtel. Retrieved February 11, 2015. ^ "LIVE FROM THE RED CARPET: THE 2015 AWARDS SEASON". Sky Network Television. Retrieved February 11, 2015. ^ Govender, Michelle (February 8, 2015). "2015 Grammy Awards live blog". DSTV. Multichoice. Retrieved February 11, 2015. ^ "The Academy Introduces The GRAMMY Awards Premiere Ceremony". The GRAMMYs. ^ "Taylor Swift - Grammy Talk". tumblr.com. ^ Lewis, Hilary (February 8, 2015). "Grammys: Ariana Grande Performs "Just a Little Bit of Your Heart"". The Hollywood Reporter. Retrieved February 9, 2015. ^ "Meghan Trainor on Twitter". Twitter. ^ "Nick Jonas Will Present at GRAMMYs This Sunday!". Archived from the original on February 4, 2015. Retrieved February 4, 2015. ^ Washington, Arlene (February 9, 2015). "Grammys 2015: Juanes Performs "Juntos"". The Hollywood Reporter. Retrieved February 9, 2015. ^ "Ryan Seacrest - Details on Beyonce's Grammy Performance, Who Will Introduce Her -". Ryan Seacrest. 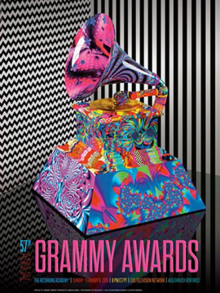 ^ "57TH GRAMMY AWARDS® SEASON IS UNDERWAY WITH CLOSE TO 13,000 SUBMISSIONS". The GRAMMYs. ^ "ARIANA GRANDE, MAROON 5, TIM MCGRAW, AND PHARRELL WILLIAMS SET TO PERFORM ON "A VERY GRAMMY® CHRISTMAS" DEC. 5 ON CBS". The GRAMMYs. ^ "Grammy Awards 2015: The Complete Winners List". Rolling Stone. ^ Caulfield, Keith (January 26, 2015). "Tom Petty Won't Win a Grammy for Sam Smith's 'Stay With Me'". Billboard. Prometheus Global Media. Retrieved March 4, 2015.